It’s been a day of ‘firsts’ today! 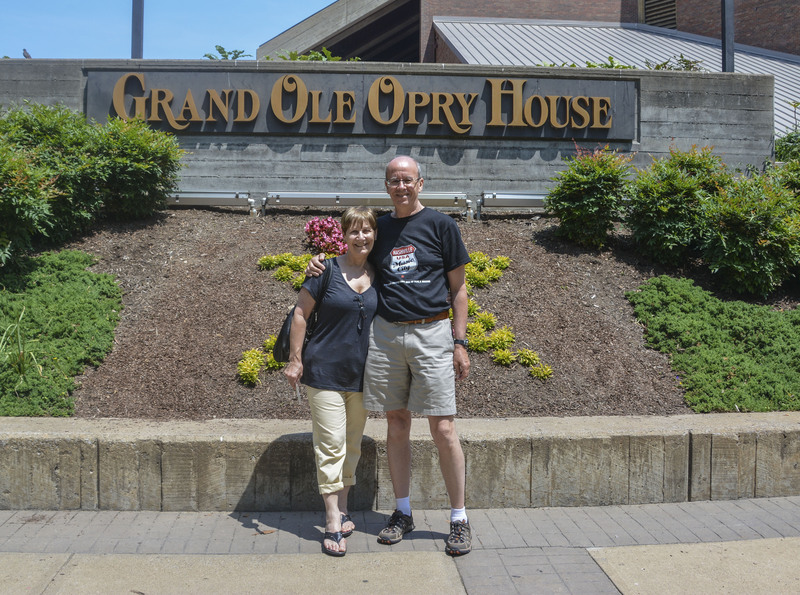 First, we did the behind the scenes tour of the home of Country music, the Grand Ole Oprey, stood on the stage and sang a song and then we ate fried green tomatoes! (The picture is a copy of the official one taken of us today so the quality is not very good). 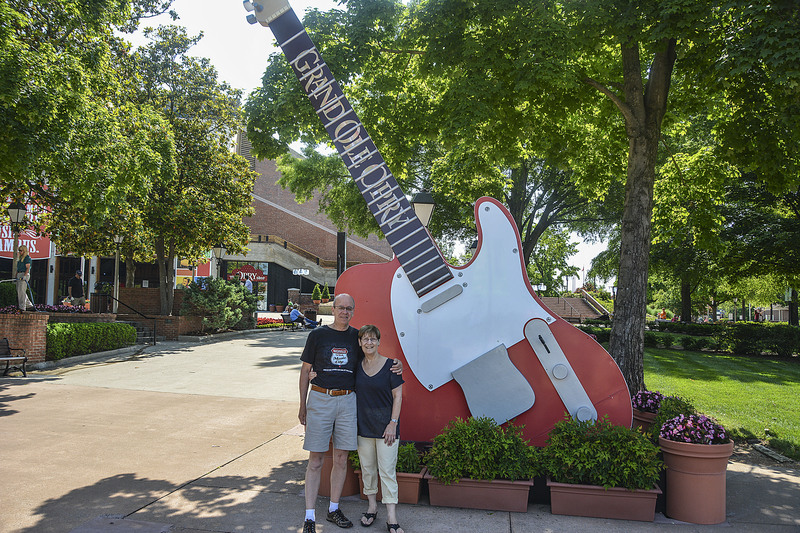 The Grand Ole Oprey was ‘born’ in 1927 and to any Country music fan is the place to be and a ‘must’ to visit. 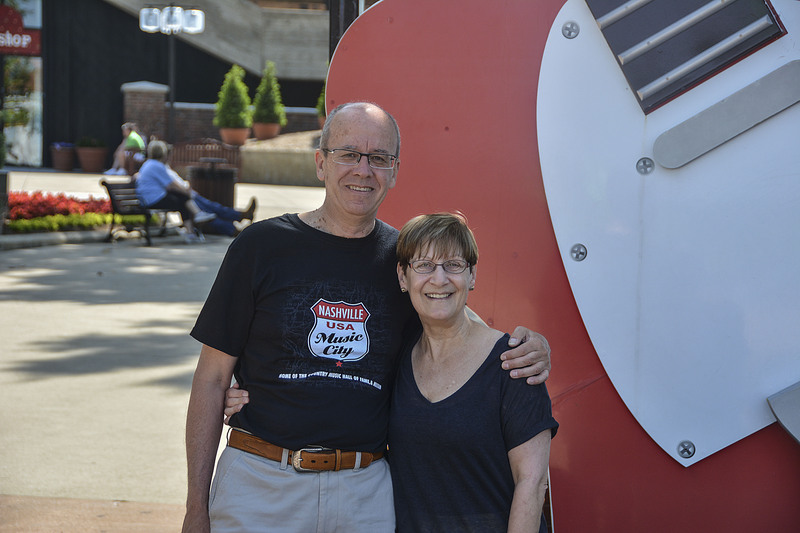 We walked in the footsteps of all the great, old and modern Country singers. 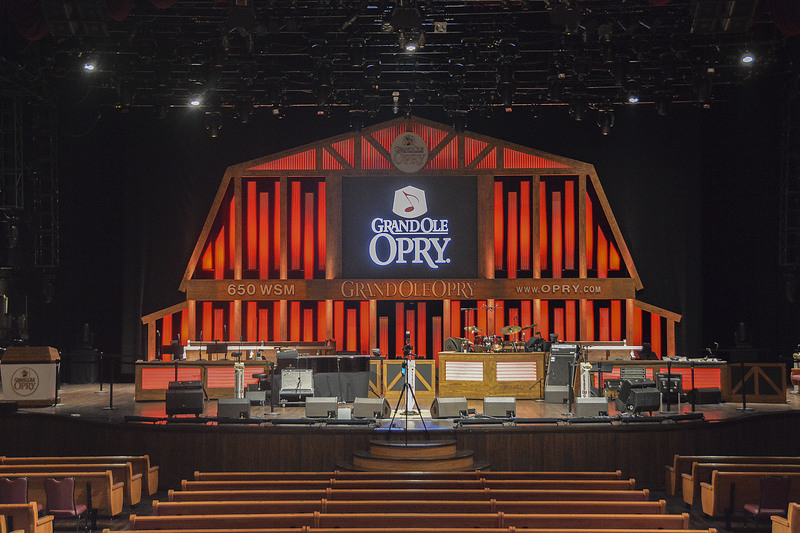 A lot of them live in Nashville and perform there on a regular basis to sold out shows of 4,400 people. One interesting fact is that each member of the Oprey has their own mail box actually in the building and if a fan sends a letter to their idol, just addressed to the star’s name and Grand Ole Oprey, then the letter is placed in the mail box and the stars come and empty their box and take the fan mail away to answer. If you have seen the film ‘Fried Green Tomatoes at the Whistle Stop Cafe’ then you will know all about fried green tomatoes. They were delicious. 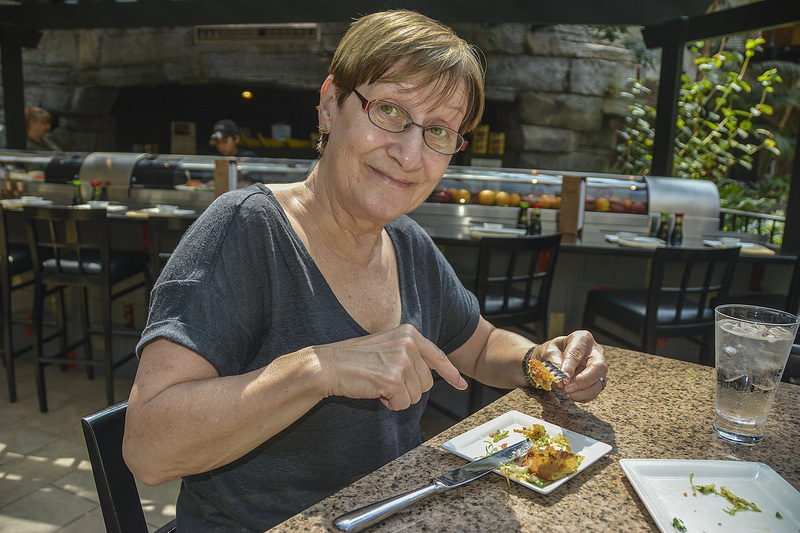 The Oprey has its own outlet shopping mall so you know what that means …………. more shopping!! It’s now official ………….. we’ve purchased the extra suitcase to put all our purchases in. It’s Memorial Day Weekend here so there’s lots of exceptional offers in all the shops so it seemed rude not to take advantage of the cheap prices. Well, that’s what we are telling ourselves anyway! We got a really good deal on the new suitcase. The other ‘first’ is that I’ve spoken to my brother, Tony, on Skype for the first time. He’s new to 21st Century technology, he’s just bought his first computer and smart phone, but he seems to be handling it all really well!! Nashville looks great and you don’t need any excuses for shopping. Dad actually managed to use skype hooray!!!!!!! Yes, he didn’t seem too stressed out by the experience!! Only one suitcase? and still so many days to go!!!! Loving your diary – all good here. We are only going to buy the one extra suitcase, once that’s full there will be no more purchases!! Promise!! Hi Si, thanks for putting the link on for us, that was very thoughtful. 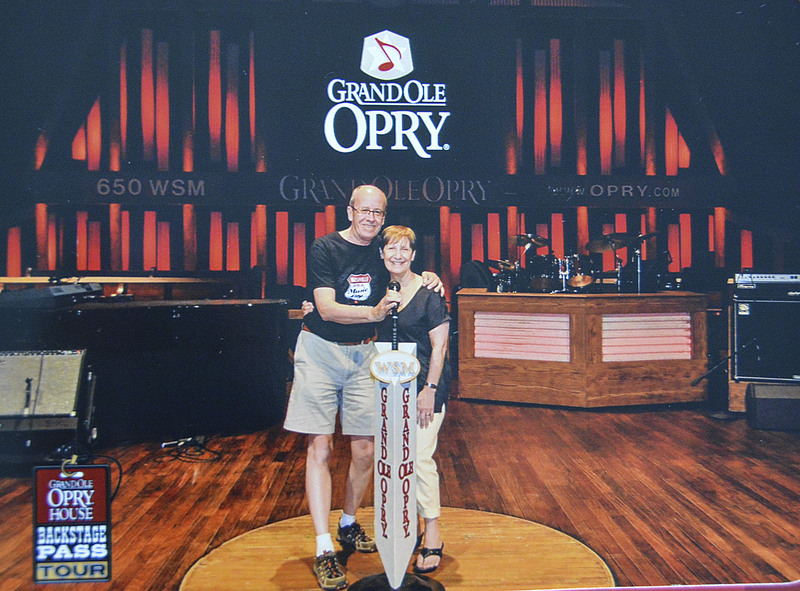 What a great pic of the two of you on the Grand Ole Opry Stage! Sandra, I thought Si forbid you to do any more shopping, hmmmmm? LOL this is ONLY Day 12! It’s not just me doing the shopping Dot, Si’s lost all sense of responsibility and is buying too!! Once that new suitcase is full then that is it.